About the project: The concept for this house was to create a grand central space formed by parallel pre-cast walls, fully glazed at each end, and topped with skillion. A helical sculptural stair accesses mezzanine spaces at both ends, with a sleeping space to one side and a workspace to the other. The single storey structures surrounding the main space contain guest accommodation and ancillary spaces. Lightweight precast panel are left exposed inside and out. This, in combination with exposed steel beams and timber floor beams, allows the primary structure of the main space to become the finished fabric. 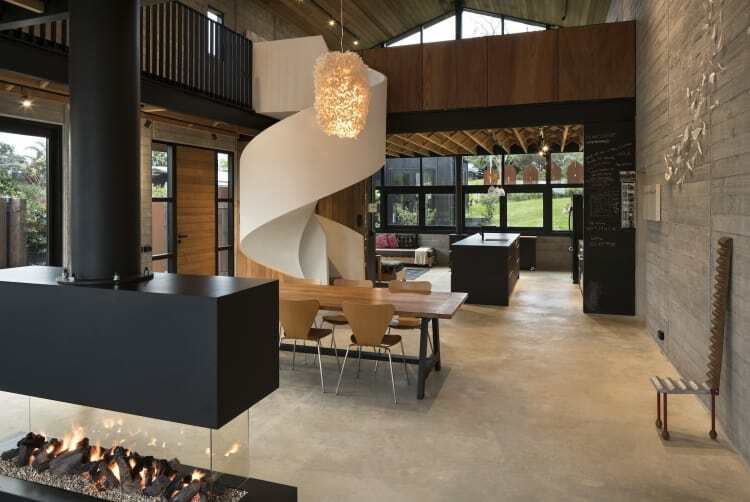 With its distinctive space planning, sculptural features and controlled use of materials, this house was a stand-out for the TIDA Homes judges.